The importance of parents in life is depending on our sanskaras and thinking. Parents play the biggest role in our development. Father & Mother play important role in our mental, physical, social, financial and career development. They help us in every step of our life. Parents are the most precious gift of God for humans. When we are happy then they are happy. They slapped on us when we did wrong. In a time of mistakes, they are like a teacher. They trained us very hard style for the future challenges. When we are happy then they are happy. They slapped on us when we did wrong. In a time of mistakes, they are like a teacher. They trained us very hard style for the future challenges. Parents are living for us. They are real God and our first teacher. They know everything about us. What we like, love and our common habits. They know what things disturb us and what kind of mental attitude we have. That’s why I think why is parents involvement important in child’s education. Because when we give our children the freedom to choose any offline or online education platform and stream, it will make them happy. Parenting a child is not easy. There are great positive effects of parental involvement in education. And I think understanding kids freedom, interest, happiness and passion will impact on their study and career. But let’s discuss today only about the importance of parents in life. Let’s undersatnd in following points, Why parents are important? Why you should respect them and their decsions in life. In the development of the child, they play many roles: A child needs to be mentally and physically strong. Parents provide everything that is helpful in our development. And sometimes they don’t have the money for the things that we want. Yes, but they arrange and they do everything to see the smile on our face. They give us milk, fruits, and proper food from time to time for our physical growth. They provide us toys and things that we can play with. They allow us to play outside the home with our friends and neighbours. They carry us to all the places they go. They teach and explain practically and theoretically about the rituals and Sanskaar. Seeing them we start following their path. If they’re respected in the society then we become so. By following the parent’s activities and lessons our neighbours and relatives started to seem to appreciate. And the Sanskaar and rituals which parents had taught us are helping today in our life. Parents do almost all the things to make us educated and well respected in the society. They admitted us in schools and college for the better education. They do all the sacrifices and reduce the own living cost for the future of their children. They provide each and everything to us, whenever and whatever we need and wherever we need. Parents work hard day and night for their children education. And they feel proud of us when we got good marks in results. Their guidance and support help us to live the life we always wanted. Our teenage activities play a big role in the direction of our life and career. This is the most tensioned situation for our parents and it is most enjoyable for us. No matter you’re doing right or wrong. But they’re always connected to you at this stage. We do lots of mistakes in this age, we try to convince parents every time for our activities with the outer world. Such as outing with friends, living with a friend, studying a particular subject or doing any other activity that parents think is not good. In this, our parents are only tensioned about the bad company. They want to know in this age from you that what you’re doing, where you’re going, what you’re eating/drinking, who is with you etc. And the tension is for you. I think most of us know about the bad companies in our society. Bad company of people and friends drive our life in the wrong direction. 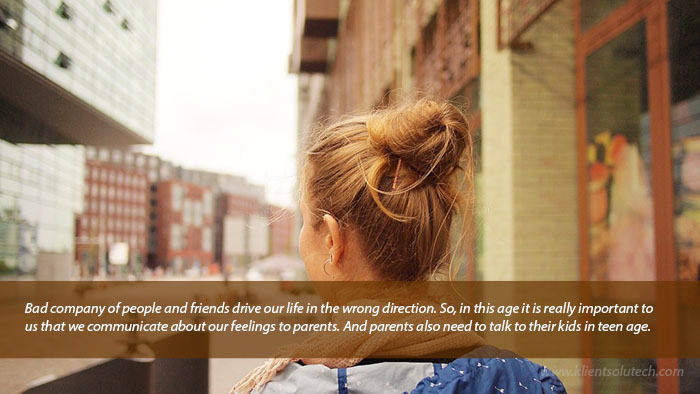 So, in this age, it is really important to us that we communicate about our feelings to parents. And parents also need to talk to their kids in teenage. We need friends to share our feelings and our parents know about this. They know by thinking about their teenage time. What right or wrong they did and what were their results. They help in our teenage by guiding us from their own experiences and thinking about our day to day activities. Parent’s guidance in teenage is most important than other people advises. We know that it was and it is very tough to follow the advice especially when it is from parents. But without their advice and without their happiness we can’t achieve what we want. Their blessings and guidance in our teenage helped us to choose good friends, the right career, and happiest living. When something bad happened or we did wrong they scold us but they support us in our difficult time in life. Whatever the situation or whatever is the problem that we are facing in life, career, and the job they try and motivate and inspire us by their own examples to make a tough into good. They try to make balance in our emotional persistent that helps to improve tough situation faster. 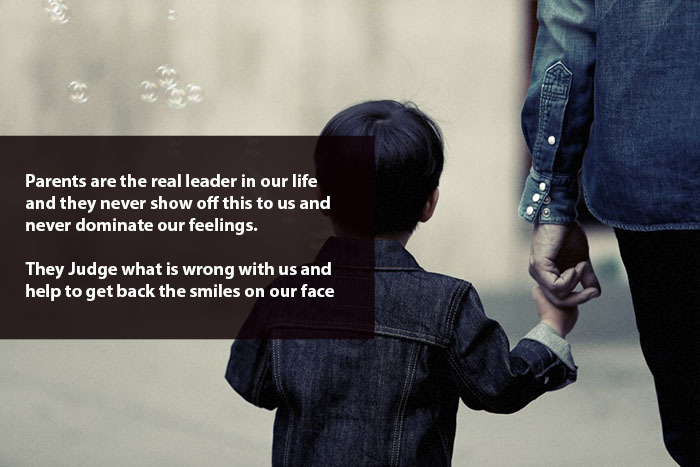 They are the real leader in our life and they never show off this to us and never dominate our feelings. It’s ok, that sometimes we feel dissatisfied and sore from them. We started behaving differently opposite to how we do, and the sooner they judge that something wrong is happening with us. That’s why when the outer world or people leave us alone, our parents are only who support us in each and every step in our life with smiles and happiness. Parents help us when we’re confused in life. What to do or what not to do? They help us in taking the important decision of life like marriage, job, business or leaving alone. They consult our interests with others; they talk to other about our feelings to get some idea or to feel secure that our decision is correct that we want to take. We know that sometimes they don’t like our decision and behave very rudely with us, but in the end, they choose our happiness other than their interests. They want a happy life for us and for that they compromised thousands of things. We know that they are happy because we’re happy. They are happy even you give them your second-hand phone. But they give you 3G or 4G to use. No one can do this in the world; only our parents can do such amazing things. They don’t mind if you’re living in the city for business or job. They just want that you’re living happily. I know friends, we can’t explain our parent’s feelings, compromises, appreciation, qualities and importance on one page. Even thousands of pages are small to write about the importance of parents in our life. But friends, I suggest you that you should take care of your parents. Always talk to them, never ignore them for others. Feel proud of parents. Respect their views, follow their guidelines, and communicate with them about your problems. Talk to them. Don’t change for show off. This world not going to give you anything, everything remains on this planet but parents are not with us for all the time. We all have to go one day. So, it is important that we love, we respect their feelings. Follow and remember their guides and compromises they are doing or did for us. Just follow the right things in life, do the important things that really matter for us. Everything else is fake, but parents are most important people in our life. Respect your parents. Believe on parents and share the importance of parents in life with others. 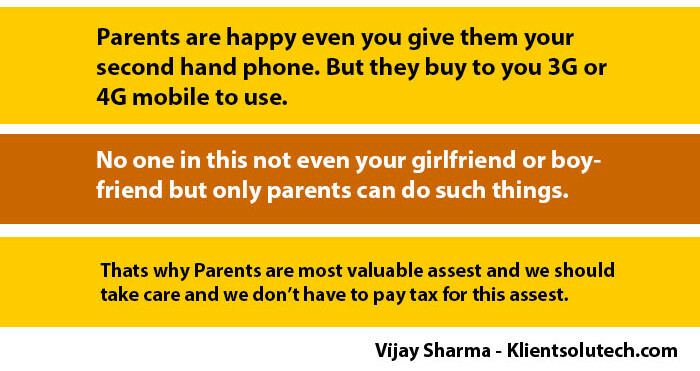 What you think, do you want to share, what is the importance of parents in life? Maa Baap ne Gale se Lagaaya !